HAIFA, ISRAEL (December 7, 2017) An international research team led by the Department of Materials Science and Engineering at the Technion-Israel Institute of Technology has discovered how a beautiful, brainless brittle star can create material similar to tempered glass underwater at ambient conditions. The findings, published in the December 8 issue of Science, may open new bio-inspired routes for toughening brittle ceramics in various applications. The researchers uncovered the unique protective mechanism of highly resistant lenses located on the arms of Ophiocoma wendtii, a coral reef-dwelling brittle starfish. On the arms of this creature are hundreds of focal lenses that hold clues to making tough ceramics. 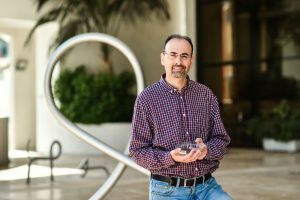 Made of chalk, the lenses are powerful and accurate, and the deciphering of their crystalline and nanoscale structure has occupied lead researcher Professor Boaz Pokroy and his team for the past three years. Prof. Pokroy researches materials created by living organisms, and produces analogous synthetic materials using methods inspired by nature. Mollusk shells, pearls, bones, and turtle shells are some examples of biominerals – minerals produced by the creature itself. In a 2001 article in the Nature, a team led by Prof. Joanna Aizenberg (who later advised Prof. Pokroy during his postdoctoral research at Harvard University), first reported on Ophiocoma wendtii’s elaborate optical system made up of microscopic lenses made of a material called calcite. These lenses focus sunlight and project it on nerve centers that transfer the information to the rest of the body through the nervous system. For the sake of comparison, tempered glass and prestressed concrete are produced by exerting pressure that compresses the material and leaves it more compact than its natural state. Glass tempering, for example, is performed by heating and then rapidly cooling the material. In this process, the outside of the material cools more quickly than the inside and thereby compresses the inside. The Technion researchers discovered that the crucial stage in the process of lens formation is the transition from the amorphous phase – the phase between liquid and solid – to the crystalline phase. At this stage calcite nanoparticles (which are richer in magnesium and characterized by being more compact on an atomic scale) separate from the rest of the material. The difference in concentration of magnesium in the calcite particles causes various degrees of hardness, density, and pressure in different regions of the material. Magnesium-rich particles press on the inner part of the lens as it crystallizes, and “temper” it into a clear and tougher crystalline material. “Just as nature exhibits creativity in improving an organism’s abilities in various contexts such as strength, sensing, and self-defense, we see very high efficiency by the brittle star’s use of existing raw materials under natural conditions to create hardy and precise transparent lenses,” said Prof. Pokroy. 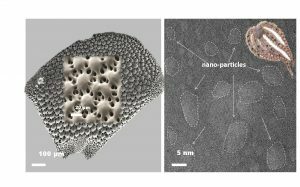 Scientists and engineers can now try to utilize this newly discovered biostrategy in toughening and strengthening synthetic ceramic materials utilized in various applications that span from optical lenses to automotive turbochargers and even biomaterial implants. The formation of calcite lenses was discovered thanks to a long series of experiments at various facilities including the ESRF synchrotron in Grenoble, France and with the Titan microscope at the Technion. The coupled analytical and experimental mechanical analysis was conducted and led by Prof. Nicola Pugno of the University of Trento and part-time at Queen Mary University of London and Edoardi Amaldi Foundation of the Italian Space Agency. Prof. Pokroy and nine other Technion researchers are responsible for the article in Science: Dr. Iryna Polishchuk, Avigail Bracha, Yael Etinger-Geller, Stas Kozachevich, Dr. Alex Katsman, Dr. Yaron Kauffmann, Dr. Davide Levy, and Leonid Bloch. 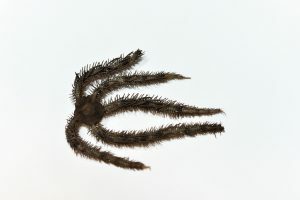 Their collaborators include Prof. Pupa Gilbert of the University of Wisconsin—Madison, Dr. Gordon Hendler of the Natural History Museum of Los Angeles County, Prof. Nicola Pugno of the University of Trento, Dr. Paul Zaslansky of Charité Hospital in Berlin, and scientists from the Synchrotron in Grenoble. 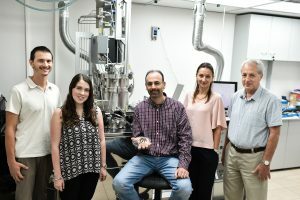 The study was conducted with the support of the Russell Berrie Nanotechnology Institute at the Technion, the Alon Fellowship, and the European Research Council.